In this provocative collection, rich with expression and dense with meaning, Scott Cairns expresses an immediate, incarnate theology of God’s power and presence in the world. Spanning thirty years and including selections from four of his previous collections, Compass of Affection illuminates the poet’s longstanding engagement with language as revelation, and with poetry as way of discovery. 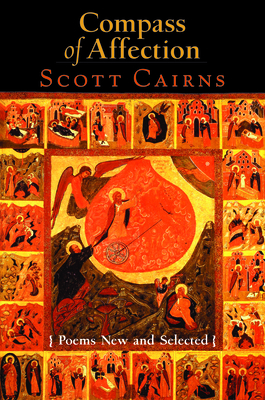 For those who already admire the poetry of Scott Cairns and for those who have yet to be introduced, this essential volume presents the best of his work – the holy made tangible, love made flesh, and theology performed rather than discussed. Scot McKnight, Ph.D. is Julius R. Mantey Professor of New Testament at Northern Seminary in Lombard Illinois. He is the award-winning author of The Jesus Creed, 40 Days Living the Jesus Creed, The Real Mary, Embracing Grace and Praying with the Church. Scot lives with his wife, Kristen, in the Chicago suburbs and has two children, Laura and Lukas, and two grandchildren. Scott Cairns (b. 1954), the Catherine Paine Middlebush Chair in English at the University of Missouri, has won numerous awards for his dozen of poetry, memoir, essays, and translations. This book is no longer “new,” but that’s besides the point. It collects 85 poems from four of Cairns’ previous books from 1985 to 2006. Cairns is a convert to Eastern Orthodoxy, and that spiritual passion is evident in his poetry. These poems challenge both mind and heart. He’s also a savvy social critic.